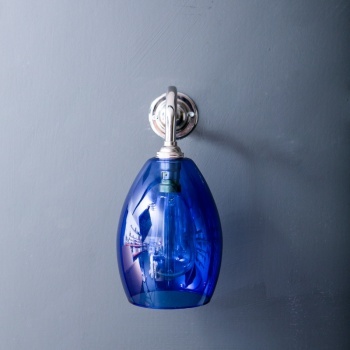 Bertie blue hand blown shade with elegant yet simple wall bracket. 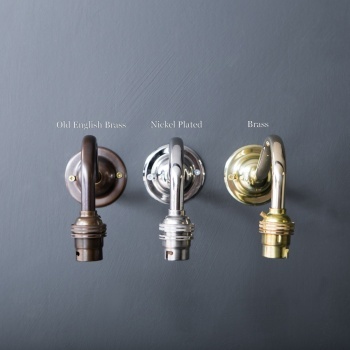 Available in nickel plated, brass or old English finish complete with British B22 lamp holder. Fabulous paired with matching Bertie pendant in a bedroom, kitchen, living room or hallway. These beautiful wall lights look great mixed with other colours or Molly and Jules shades. Blue glass is beautiful teamed with bold colourful fabrics and equally splendid as the stand out piece amid a grey, black or white decor. Perfect for your kitchen, sitting room or bedroom. 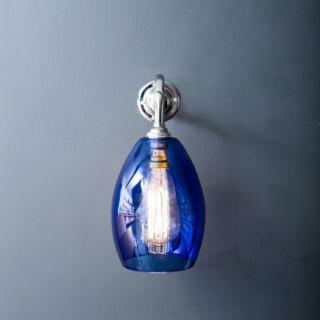 Visit our Accessories page to add a vintage light bulb to your order and complete the look. Stunning British Blue Bertie coloured glass lampshade, c/w British B22 lamp holder and wall bracket. 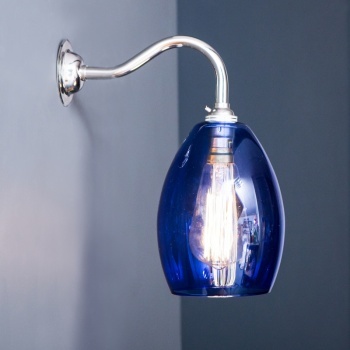 Our Bertie shade with elegant yet simple wall bracket and B22 lampholder brighten up any room. Fabulous paired with matching Bertie pendant in a bedroom, living room or hallway. These beautiful wall lights look great mixed with other colours or Molly and Jules shades. 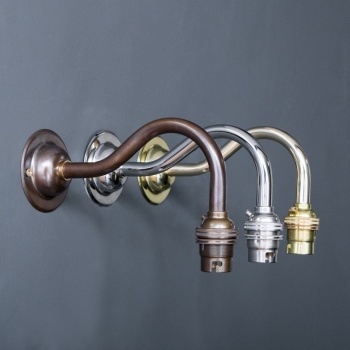 Visit our accessories page to add a vintage light bulb and complete the look. Supplied without light bulb. Please note that all electrical fixtures and fittings should be installed by a qualified electrician. All individual electrical components carry CE (European) approval Dimensions: Shade size 12cm width x 16cm height, c/w British made B22 lamp holder and wall bracket, Total length 25cm x total depth 22cm x width 12cm. All our lighting is designed, produced and assembled in the UK, each light fitting is hand made to order in our Yorkshire workshop.